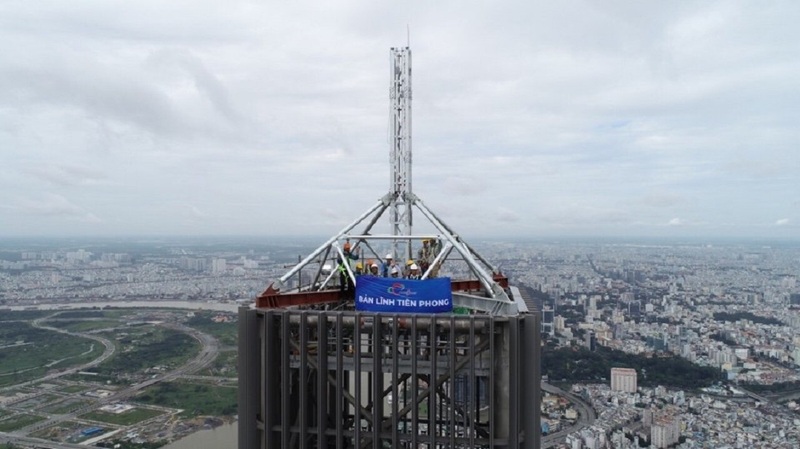 Last August, Coteccons finished the article of antenna installation on the top of Landmark 81. The antenna has the height of 8.3 meters, is placed on spire and is the receiving - broadcasting television signals antenna of the whole Ho Chi Minh City. After installing the antenna, the official height of Landmark 81 has reached at almost 470 meters. In order to successfully carry out this article, site management team has closely cooperated with the company’s technical department and partners to propose the ultimate efficient and safe construction methods. At the time when the decision to install the antenna was made, all the tower crane for construction had been dismantled. Therefore, the biggest challenge for Coteccons is to calculate how the antenna components could reach the top of the spire for installation. Constructing at 461.2 meters is never easy for anyone. Site’s engineers and workers had to face weather conditions such as fog, wind, sunlight, rain, heat; all at its extreme. That explains why the health inspection when each workday begins is always a must and is completely and seriously done by Safety Officers. As a matter of fact, to put aside the height from the 82nd floor to the top of the spire, engineers and workers had to climb more than 71 meters each day, with 200 stair-steps. But there were days when they had only just set their feet on the top of the tower, the clouds came and the rain suddenly poured torrentially. Then they had to hurry down from all the way. Sometimes they made it down in-tact, sometimes they did not, which was when they was drowned in the rain, soaking wet. Difficult and challenging as it was, with the experience, competence and above all, strong will and trust, Coteccons people continue to complete the final category of “roof of Southeast Asia”.